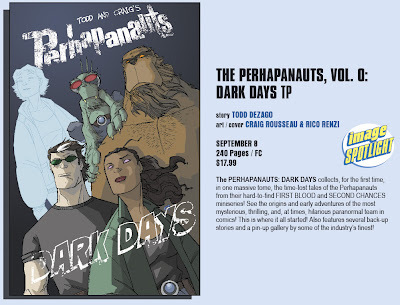 so one of the things craig and i are always hearing when we're at shows or conventions or store signings is, "hey--when are you gonna collect all of those elusive, hard-to-find (which mean the same thing...) perhapanauts stories from your early dark horse runs...?" or "when will we have those two fantastic miniseries bound in one massive tome that can sit on the shelf next to my beautiful perhapanauts: triangle trade paperback?" or "do you know where geoff johns' table is?" well, perhapa-fans--the wait is over...! Berkeley, CA - 10 June 2010 - How did Bigfoot, a chupacabra, the Mothman and an assortment of other people, human and fantastic alike, become part of an organization dedicated to protecting the world from the strange and terrible creatures that lurk in the dark? 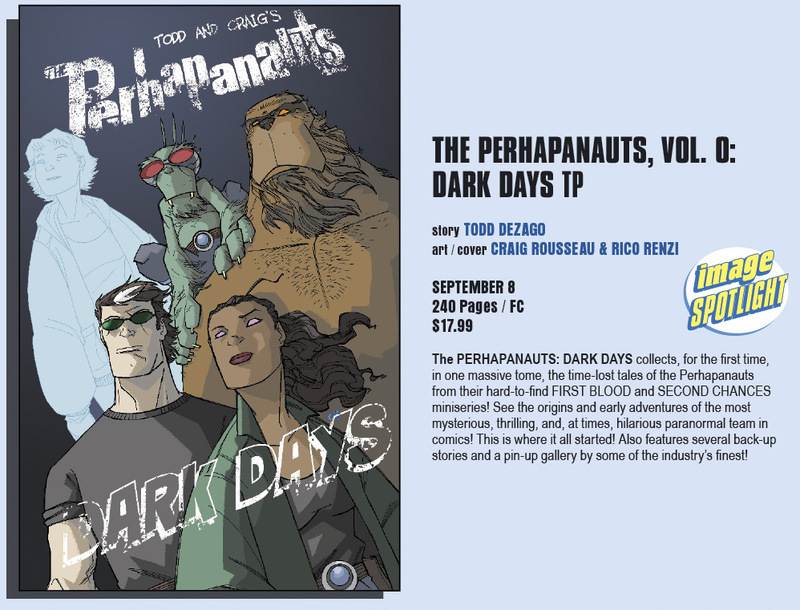 THE PERHAPANAUTS, VOL. 0: DARK DAYS by writer Todd Dezago and artist Craig Rousseau will answer that question on September 8, 2010. THE PERHAPANAUTS, VOL. 0 collects in one massive tome, for the first time, the time-lost tales of the Perhapanauts from their hard-to-find FIRST BLOOD and SECOND CHANCES miniseries! See the origins and early adventures of the most mysterious, thrilling and, at times, hilarious paranormal team in comics! This is where it all started! The book also features several back-up stories and a pin-up gallery by some of the industry's finest! so start your christmas shopping early--this one's gonna be sweet! we numbered it 'ZERO' so you'll know where it goes on your bookshelf. you're welcome. i got so caught up in all the stuff we were looking at last week, that i forgot to mention that super hero squad! #6 hit the stands last wednesday and it is just chock-full of savage land-y fun! 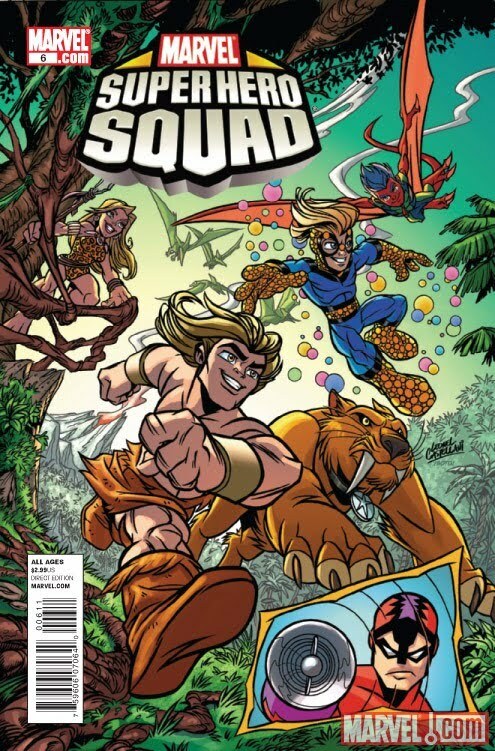 in a story that was originally s'posed to be a humorous homage to mike's and my savage land story from way back in sensational spider-man's no.s 13-15, the squaddies race to the home of ka-zar and shanna to stop stegron from rallying his dinosaur troops to take over the world! when my editor, nate cosby, asked me if i'd do this (he was a huge fan of the original tale...) i said absolutely--can we use spider-man? he said absolutely and so i got to work writing up the story. two months later we found out that, actually, no, we can't use spider-man (i know...! crazy, right? but it was actually due to the animation licensing agreements...who knew?) and so we had to come up with another teenaged marvel character to retro fit into the action. i want to thank speedball for stepping in at the last minute--i think he did a really fine job and hope to use him again in an upcoming adventure...! "do you know where geoff johns' table is?" "over there where the cool kids sit." "he's the one who's chained to the dc table." I saw that press release for Vol. 0 this weekend and jumped for joy. As for the Squaddies, Todd, as I read this issue this weekend, I could not help but think of you sitting at your keyboard in your upstate New York farmhouse of solitude smiling from ear to ear as you typed the script for this one. Man, that was just a fun, fun read from start to finish. Excellent news on the 'Haps Essential/Compendium/Etc. About time you lads step up with a big book to garner the larger audience you deserve. Also, need to hunt down the latest couple issues of Super Hero Squad as it's on my pull list, but we've only received up to issue three. I'll be quoting Thor to my comic-monger, "I would have words with you.